Thank you to those who donated to the cause! I planned to complete the run on Saturday morning, August 25th, and that is still my plan. However, I got home last night just after 7:00 PM and I hadn't run yet, so I quickly changed and went out to train. Well, I ended up doing from 3.3 - 3.4 miles so I guess my backup plan is that I've already completed the run! The weather was great! I don't time myself nor listen to music and my running is very low-tech. After many years of running, some time ago, I abandoned all the bells and whistles and just run ... ha ha Anyway, it was a great run and I was inspired by the knowledge that I was running to fulfill a commitment to my donors. The money is already there, so it's about the positive impact we can have on some of the animal friends we have, to open our hearts and homes to companions and family members who enrich our lives! Thanks, again, and my wife and I are upping our donation to match that of our largest donor as another way of expressing our appreciation. 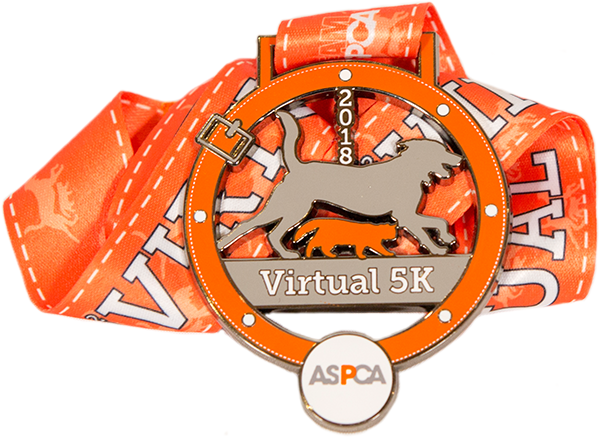 Hi, I'm running a "Virtual 5K" to benefit ASPCA! "Virtual" means I can do it any time from August 11th through the 26th and at any location. It isn't a single race day for all participants. I'll take advantage of one of my regular weekend training runs to complete the distance. Will you support my (modest) fundraising effort and help me reach my goal? My wife and I are regular supporters of the ASPCA, via a monthly gift, as well as supporters of local shelters, trap-neuter-return groups and both national and international animal services organizations. All four of our kitties are shelter animals and bring us great comfort and joy (and sometimes headaches, but mostly joy) every day. Miss Gini, for whom I named my site, was my wife's kitty when we married and was our shared companion and family until she passed away 12 years ago. I know you care for the welfare of animals, and, if you are able to assist with my campaign, it will be greatly appreciated.